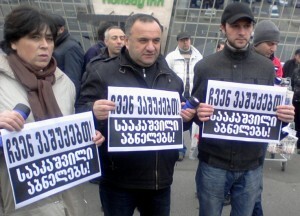 TBILISI, DFWatch – Representatives of the media, press distributors and other supporters gathered Friday in front of the Holiday Inn at the center of Tbilisi to once again protest against the situation created around the newspapers and press distributing kiosks. ‘We light, Saakashvili darkens’ – this was the message written on fliers that rally participants were holding today. It is connected to Tbilisi City Hall’s program called ‘1000 booths’. Under the new project City Hall announced an auction to locate booths around in the capital, exactly on places where there have been newspaper kiosks for a long time. Shortly after this project was announced, hundreds of kiosks were taken away. As a result, it affected most of the newspapers and their runs. They have had to reduce their circulation, and the press distributor companies have already fired many of their personnel. People were holding lamps and lights as a symbol – to look for booths and kiosks which have been standing for years on specific places but now have disappeared. “This is forcing print media towards bankruptcy. With these lamps we are looking for the booths which City Hall has taken away,” Mamuka Glonti, co-founder of the Maestro TV, says. ‘Do not buy anything here, it took away the kiosk from the press’ – this is another message printed on fliers which the organizers say are going to be posted at places where newspaper booths have been located. Press distributors with small carts also appeared at Friday’s rally. Together with the others, they marched from the front of Holiday Inn to the other side of the street at the exact location where one of the booths had been located. “The loveliest booth and one of my favorite ones,” one of the activists was yelling.